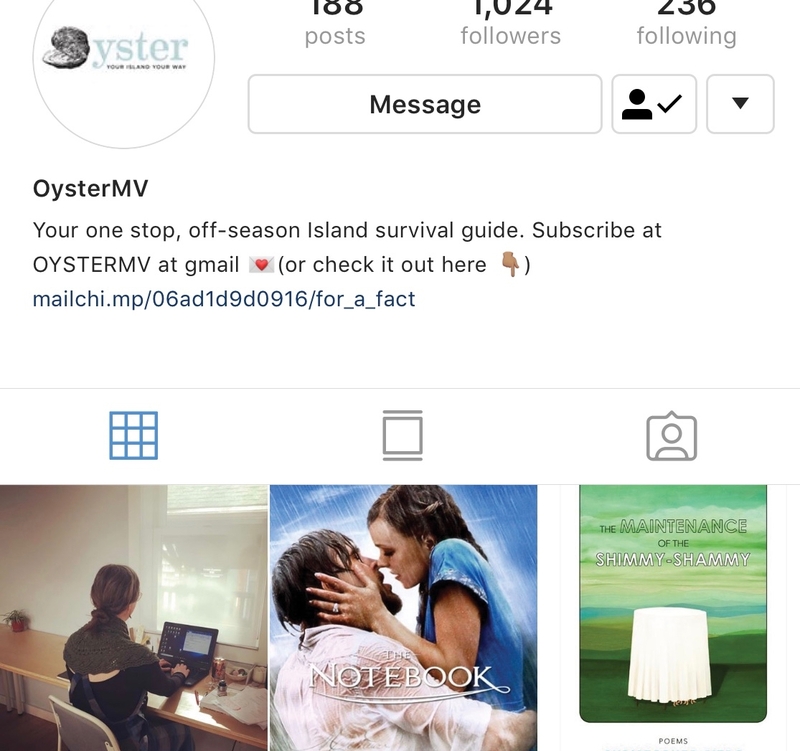 It seems fitting that OysterMV launched on Instagram. The account surfaced last winter, with posts appearing a few times a week highlighting upcoming community events that ranged from yoga classes to tarot card readings. What distinguished it from other Vineyard calendars, though, were special discounts for “Oysters,” defined as that rarest generation of Island residents — twenty-somethings. OysterMV uses Instagram to communicate about events and special opportunities. Alex said the idea for OysterMV came to her a couple of years ago when she started thinking about her own experience living year-round on the Island in her twenties. She remembered that during the long off-season it was often difficult to find engaging activities where she could escape the winter isolation and meet other young people. Already involved in the work of several Island non-profits, Alex approached them with her new idea. Why not create off-season community programming for young adults? The response was overwhelming. “I was really surprised by how receptive people were to it and how supportive the Island community has been,” she said, adding that she’s received support from organizations like Martha’s Vineyard Community Services, the YMCA and The Trustees of Reservations. Wanting to avoid a formal name that would scare young people off, Alex said the word “oyster” quickly came to mind. “I just wanted it to be a fun word. Everyone loves oysters, we live on an Island, and the world is, in fact, your oyster,” she said. Over the past year, OysterMV has hosted dozens of events across the Island, indoors and out. 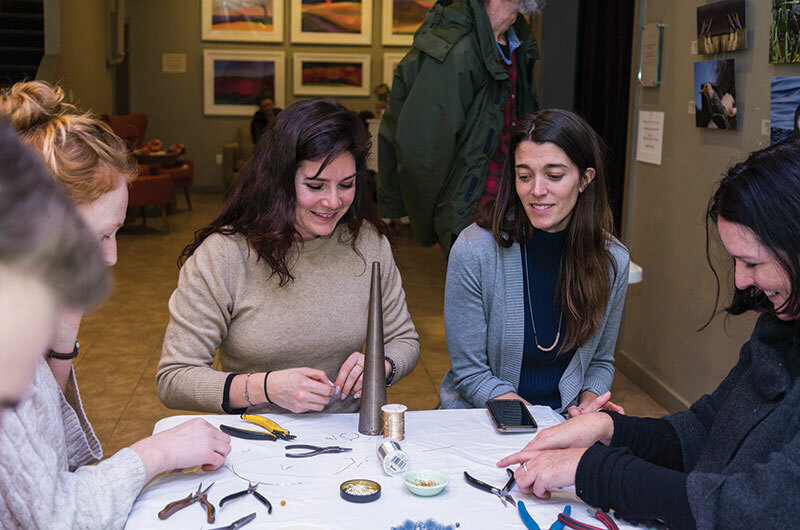 There’s been an oversand drive at Cape Poge in search of snowy owls, screenings of classic 1990s movies at the film center, and several crafting evenings led by young Island artists. Walker Roman is one of them, and also a member of the OysterMV advisory board that helps brainstorm ideas for future events. 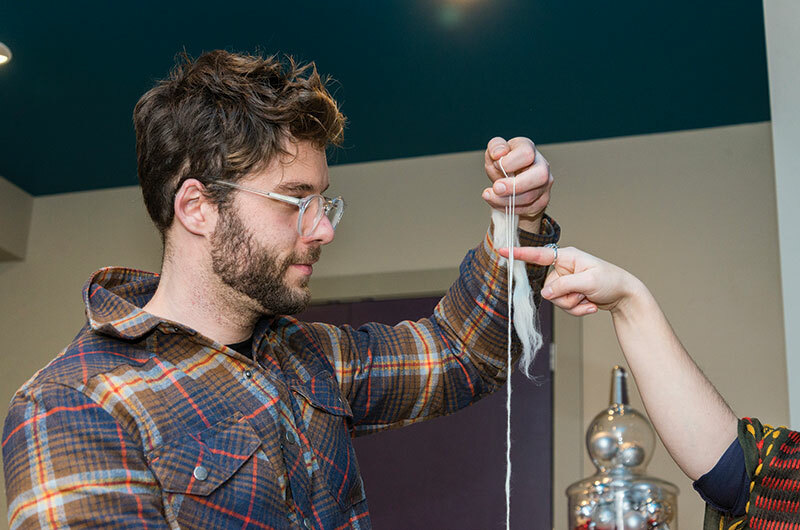 At a January OysterMV event this year, Walker taught a group how to drop spin with animal fiber, what he called a “pre-Renaissance” way of spinning yarn. He said he was hooked after his first OysterMV event, a showing of The Royal Tenenbaums, where he ran into friends he hadn’t seen in years. Though Walker was born on the Island and grew up here, he said he understands full well the struggle of creating a close-knit group of friends during the winter. He added that thanks to OysterMV he’s made new friends and even started working his schedule around events. Angela Sison, an Island designer who runs the boutique Conrado in Vineyard Haven, said she immediately felt the isolation of the off-season when she moved to the Island three years ago. Like many of her fellow Oysters, Angela found Alex’s posts on Instagram and decided to step outside of her comfort zone to get involved. As a bonus, OysterMV events have also provided her with a chance to connect with other young Island entrepreneurs and to show off her line of sustainable women’s clothing. 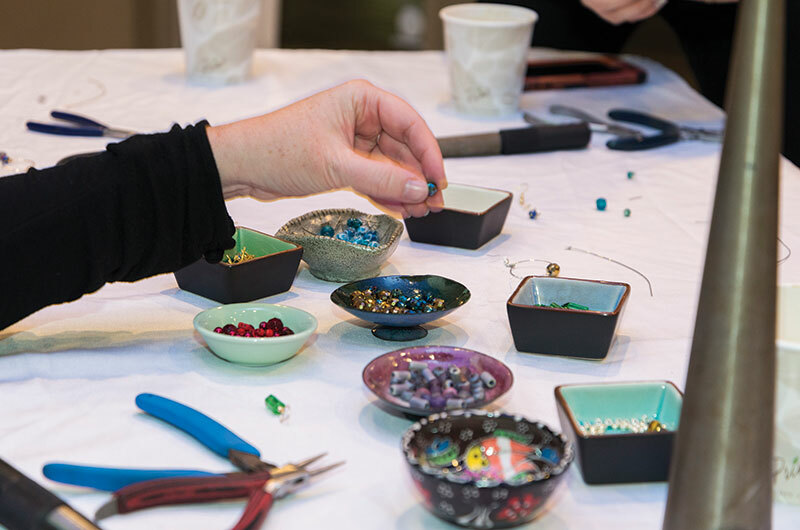 She set up shop for the first time in December at a holiday pop-up event held at the film center. Getting the word out about events has been the biggest challenge so far, Alex reported. That, and convincing people to leave Netflix and their couches for just one night a week. Still, she said, each event has drawn more people than the last and she’s already planning a series of activities for the coming months, including cooking classes and mending/stitching workshops. 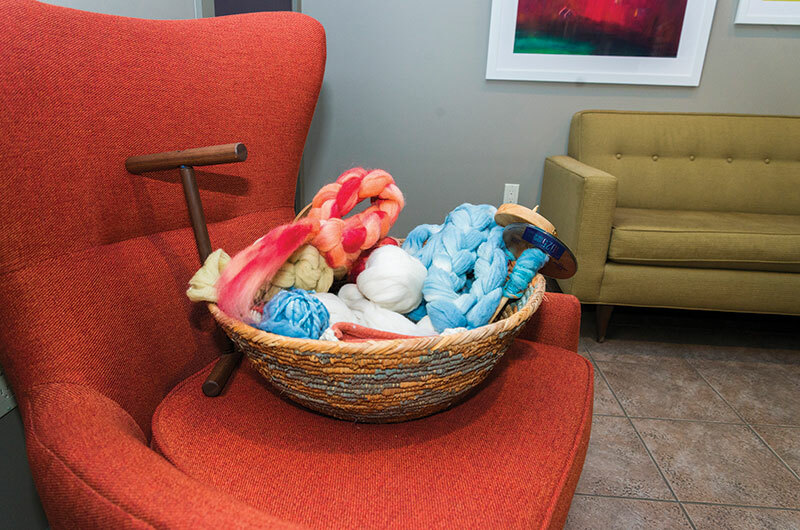 “I think this population is deserving of a little extra support in this way given inherent obstacles that come with deciding to build a life here,” she said. In the meantime, Alex said her goal is to grow participation at events and work with her advisory committee to expand OysterMV’s offerings. She said she’s already encouraged by the enthusiastic response from young Islanders just one year in, and she’s optimistic that it can become a Vineyard mainstay. Landry Harlan is a reporter for the Vineyard Gazette. The MV Film Center loves hosting the free monthly film night/Oyster MV events. Alex and colleagues do a terrific job pulling an interesting evening together.